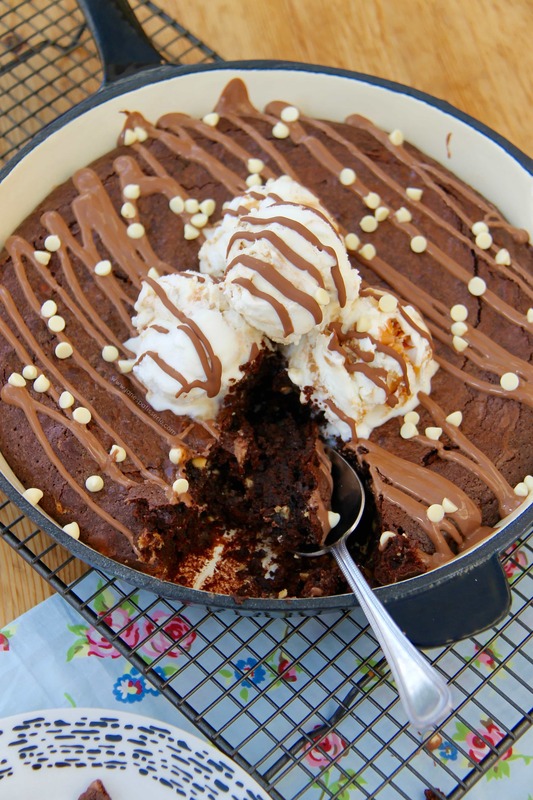 A Giant Triple Chocolate Brownie Baked in a Skillet – Drizzle with Melted Chocolate, and topped with Ice-Cream! 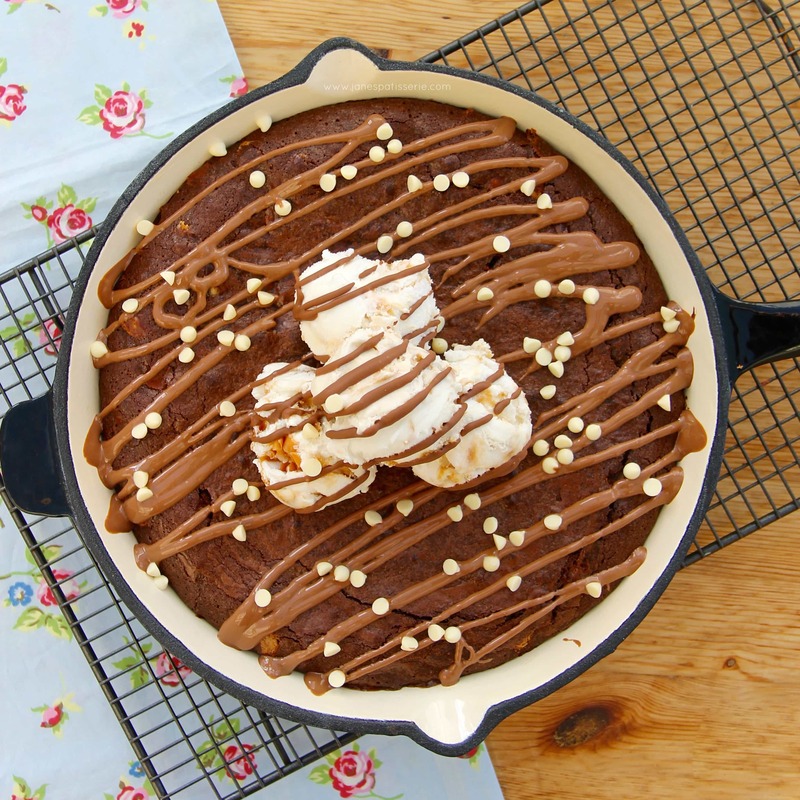 Last week I posted my delicious recipe for my Chocolate Chip Skillet Cookie and it has been a massive hit – how can anyone not love a GIANT cookie that you can devour for yourself?! But anyway… this led me to post this recipe. 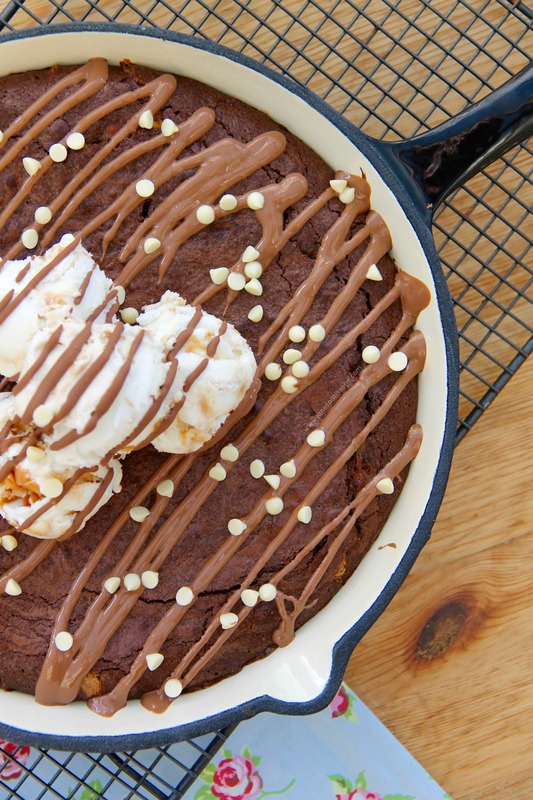 I have always loved baking in a skillet, but a brownie in a skillet is just delicious! Like, I’d eat it all to myself with a spoon happily. 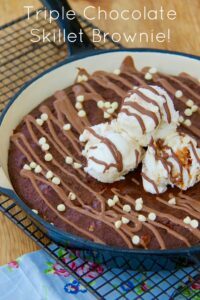 I posted my regular Triple Chocolate Brownies recipe just before christmas, and this is essentially the Skillet version. 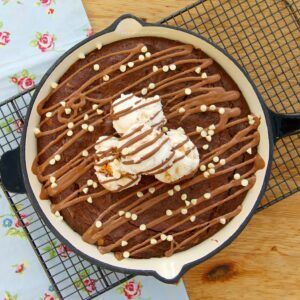 The method for this brownie however is easier, and can be made in just one bowl if you wanted – saves on the washing up. 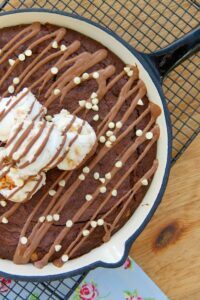 I find that with this skillet recipe you don’t have to whisk the eggs and sugar up to a thick mousse texture as the skillet heats to such a high temperature, it bakes the brownies in a different way – so it works easily! I decided with my Brownie that I would dollop on some yummy Salted Caramel Ice-Cream (shop bought I’m afraid!) 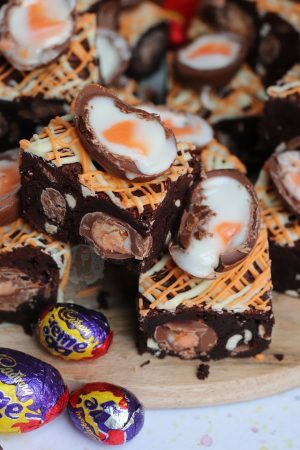 and cover it in melted chocolate – to make it a brownie lovers absolute dream. I must admit, it was DELICIOUS. My No-Churn Salted Caramel Ice-Cream however would be the perfect and easy no-churn ice-cream to make at home to marry with the Brownie however! This brownie can be made and just treated as a normal brownie, or you can bake it and enjoy it easily around the table with your friends and family – the possibilities are endless, and all equally as delicious. 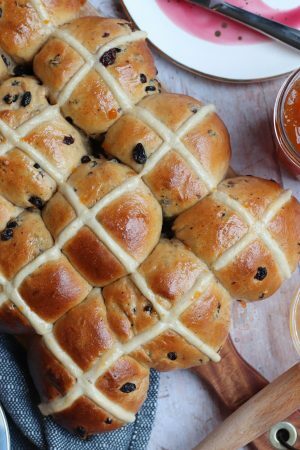 If you don’t have a skillet its not a problem, you can use a normal frying pan (if it has no plastic on it as it might melt) but if you can invest in a skillet I would – they’re delicious and perfect for sweet and savoury bakes! 1) Preheat your oven to 180C/170C Fan and prep your 10″ cast iron skillet if need be – I also lightly grease mine. 3) Leave the Chocolate mixture to cool for 10 minutes. Then, mix in the sugar with a spatula. Add in the lightly beaten eggs & Vanilla and lightly beat till smooth – it won’t take too long at all, and you don’t want to overbeat it! 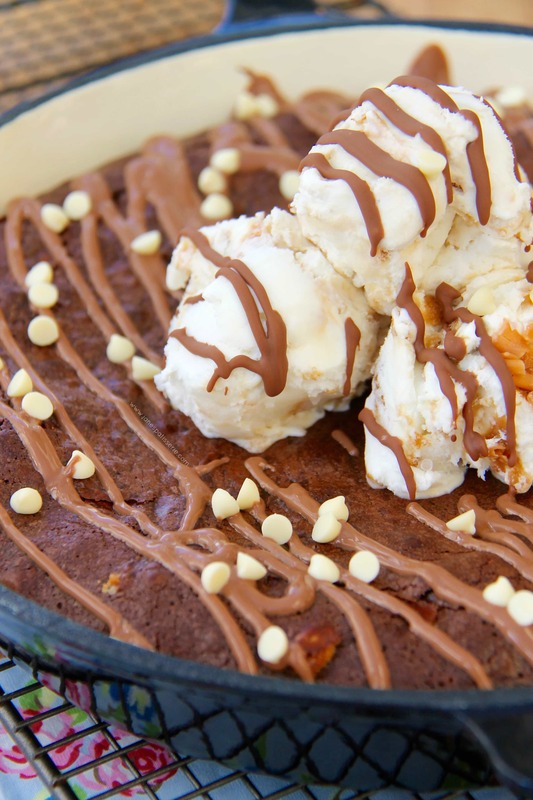 5) Remove the Brownie from the oven CAREFULLY as the skillet will be EXTREMELY hot! Leave to cool slightly – If serving immediately, dollop over some Ice-Cream of your choice (I used Salted Caramel Ice-cream) and drizzle with melted Chocolate! As its a brownie, I used all White Chocolate as its my favourite. 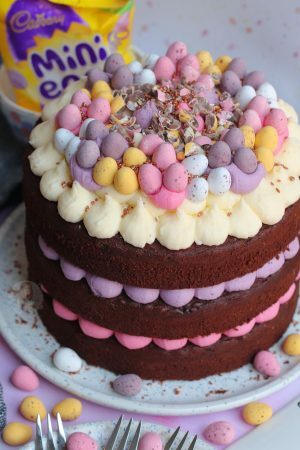 I wouldn’t use more than 300g as it might not bake properly – but you can use a mixture of chocolate chips if you like! 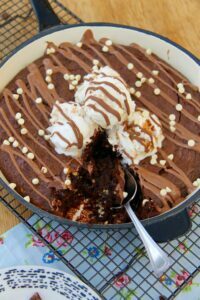 The Ice-Cream and the chocolate on top isn’t essential to the recipe, and its up to you how much you use – I just think its oooy-gooey perfection! 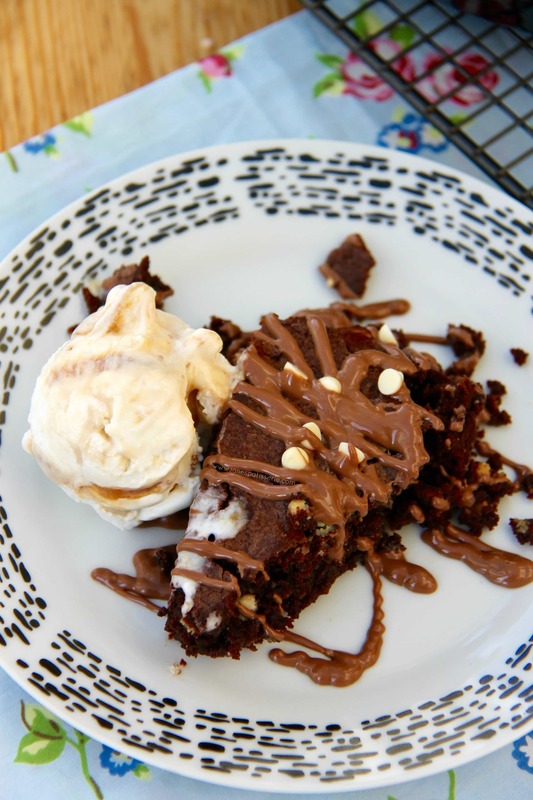 Find my other Dessert & Brownie Recipes on my Recipes Page! Older Next post: No-Bake Daim Bar Cheesecake! Newer Previous post: Perfect Crepes! 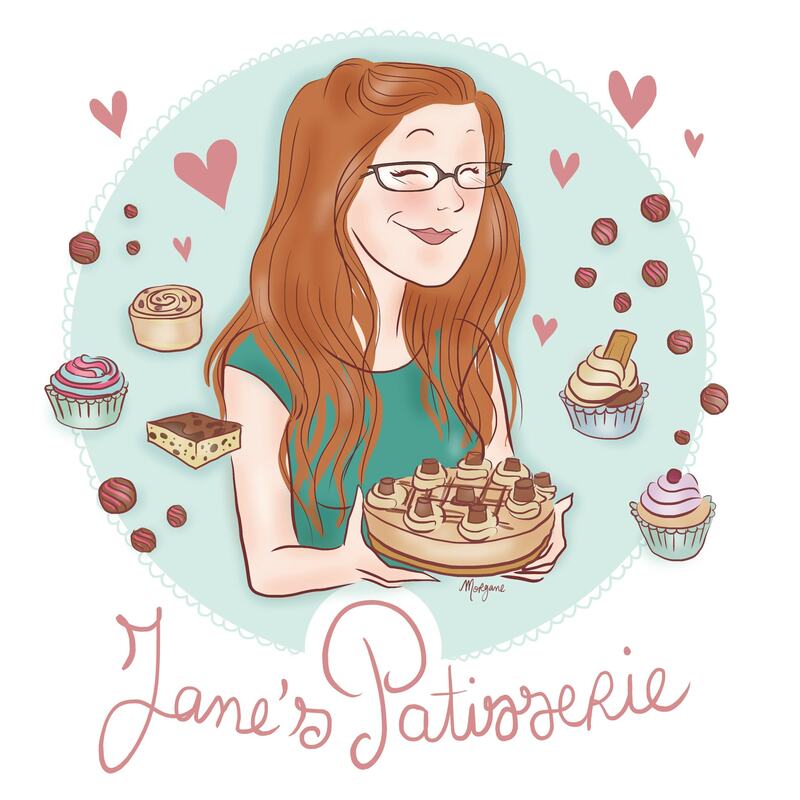 Jane this looks so divine!! I didn’t think anything could be better than a skillet cookie dough dessert but you’ve convinced me! ? Haha yes, I love them all – they’re just so delicious!